Senior Iranian official says Washington violating nuclear deal by stating that military option is still on the table. A senior Iranian official is accusing the United States of violating the nuclear deal with his country, by making comments indicating that the accord would make any attack on Iran’s atomic program more efficient, The Associated Press (AP) reported on Friday. As part of White House pushback against congressional and other critics of the deal, Earnest, in his comments to reporters July 17 said that the American “military option would remain on the table” if Iran breaks out of the deal and races to make a bomb. 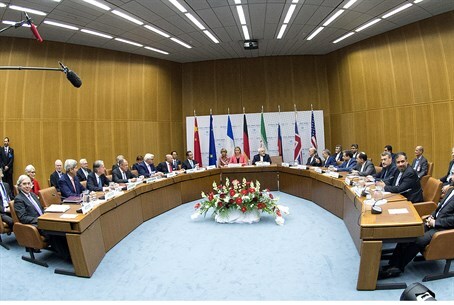 Najafi added the statement “seriously undermines the very basic principles” needed to implement the deal and also claimed that the comments amount to “a material breach of the commitments” agreed to by the United States and the five other world powers at the negotiating table with Iran. Earnest’s comments were echoed several days by Defense Secretary Ashton Carter, who said the Iran nuclear deal does not mean military action is off the table when it comes to stopping Tehran from obtaining an atomic bomb. "One of the reasons why this deal is a good one is that it does nothing to prevent the military option," Carter said. "We are preserving and continually improving" such a military option should Iran violate the terms of the agreement, he added. Meanwhile, Congress is continuing to review the deal, which it has 60 days to do. Congressional hearings have revealed the classified sections of the deal have the leading state sponsor of terror inspect its own covert nuclear sites, in one of numerous caveats of the deal that have critics highly concerned. Congress has until Sept. 17 to accept or reject the agreement, though President Barack Obama has threatened to "veto any legislation" passed by Congress blocking the deal. Republicans have objected to the deal as not tough enough to prevent Iran obtaining a nuclear weapon in the long run, while several Democrats have expressed support.